Alligator Pepper, nothing to do with alligators but definitely 'peppery. I came across these as a child when we would go to my village in Delta State, Nigeria and my grandfather had to 'present Kola' to his guests, even if it was his cousin from down the street. Most especially, if there were serious issues to deliberate, there would be no discussion without it. It is taboo to have any major event without it. The aromatic flavouring of these seeds give our famed West African 'pepper soups' their unique taste and effect. This creates a very spicy broth and is especially good in helping to clear the sinuses. Pepper soup in southern Nigeria is a delicacy often given to mothers of newly born babies and in some traditions, a new born baby has a dab of the ground seeds on its tongue supposedly to make them tough. 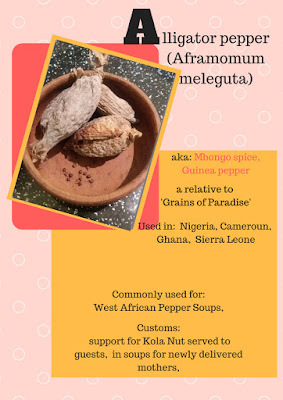 Alligator pepper, definitely a prized possession in a West African's kitchen cupboard. These lot were bought at Ades Cash and Carry store and may be found in your local Afro Caribbean grocery store. Why not take 'The Spicy Challenge' and add some ground Alligator Pepper seeds to your regular broth and let us know how it goes 😄.